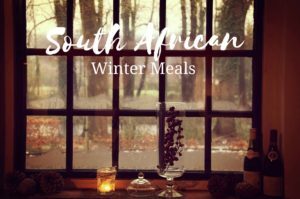 South African Winter Meals are the one thing you need to spice up your January. It is midwinter, the weather is gloomy, the days are short and there’s not much to do at night. The thought of the fresh and breezy South African summer only brings nostalgia. Luckily there are plenty of culinary weapons to battle the winter moodiness. Mid-January is the best time for cosy dinner parties where delicious food is served. What could be better than a nice chat over a glass of glühwein and meals to remind us of home? When it comes to cold weather culinary warmers malva pudding quickly springs to mind. Sweet, sticky and rich in flavour, the pudding is usually made with Apricot jam. Its spongy caramelised texture is especially appealing to those who like their dessert soft and juicy. A cream sauce is often poured over the pudding while it is hot, and it is usually served hot with custard and/or ice-cream. It is of Cape Dutch origin and comes with many additions which differ from one area to the next. Cape brandy pudding with brandy and dates is the most popular variant. Malva pudding rose to international fame when it was cooked by Art Smith, Oprah Winfrey’s personal chef during The Oprah Winfrey Leadership Academy’s first Christmas dinner. Here is how to make your own Malva pudding. In case sweet is not your thing, a potjie meal in the winter might be worth a try. It contains meat (venison and biltong) beer and vegetables and is flavoured with the distinctive spices from Durban area. Cooking Potjie is quite a bit demanding as it is traditionally made in potjie /a cast iron three-legged pot/ and heated over an open fire. Here are some original potjie recipes for your enjoyment. Another South African winter classic is Bobotie. Its name is believed to be of Malayan origin, though the meal itself was first prepared in the Ancient Rome 2000 years ago. Juicy layers of meat are packed in a dish with chopped almonds. Bobotie’s preparation certainly leaves a room for improvisation. And South Africans often joke that there are as many Bobotie recipes as there are mothers in the country. Here are some useful tips for those eager to indulge in Bobotie. Those who would prefer their winter culinary feast meat free, should try aubergine and lentil tajine. It is full of flavour, tender and juicy. In most recipes the ingredients are browned off first in a heady mix of spices, the most common being cinnamon, ginger, saffron, cumin, turmeric, paprika and chilli. Next the vegetables, liquid and fruits are added. Once the lid’s on, it’s left on a low heat for hours and hours, until the sauce has thickened and the vegetables have softened. Here is a detailed recipe to try at home. Good food is the perfect way to warm up your winter dinner party. It goes well with some quality drinks and a happy company to share them with. And it brings us closer to South Africa we all miss so much.